With the return of the school year comes the return of our regular committee schedule. During the summer months, Council will place all of the regular July meetings in the first two weeks of the month and place all of the August meetings toward the end of the month, thus creating somewhat of a break from Committee work. September 7th will be our next Agriculture & Rural Affairs Committee following our last meeting in early July. Also included is a report that includes some zoning by-law amendments to accommodate reconstruction efforts in parts of the city that were impacted by the severe flooding in May of this year. Another report is a quarterly Omnibus Zoning By-Law Amendment report, which we will receive a brief presentation on with regard to any impacts in the rural area. As always, ARAC meetings are held at Ben Franklin Place in Centrepointe in the former Nepean Council Chambers. Our meetings begin at 10:00am. All of the items listed above are available for review at Ottawa.ca or through our monthly e-Newsletter, which you can sign up for at RideauGoulbourn.ca. Last year, the City of Ottawa began a review of the current City By-Laws that regulate site alteration activities. Over the last several months, City staff have engaged with local residents, farming organizations and environmental groups to create a new Site Alteration By-Law for the City of Ottawa. The City’s goal with this new by-law is to prevent drainage problems, protect the productivity of soils in designated Agricultural Resource Areas, protect designated natural areas and other identified natural heritage features (such as significant woodlands and valleylands) from negative impacts, reduce the risk of root damage to City-owned trees or other trees protected under the City’s tree by-laws and to establish basic rules for how site alteration is done, to avoid impacts to neighbours and the environment. Ultimately, the driving force behind this proposal is the impacts on agricultural lands by those wishing to development. In some cases, we have seen land manipulation in an effort to downgrade land from agricultural to a use more compatible with development. One thing I would like to see in this by-law is an outright exemption for normal agricultural activities. That exemption doesn’t yet exist. I would encourage any landowner or resident who has an interest in site alteration activities to review the draft by-law which is available on Ottawa.ca and to provide your feedback to City staff. As always, you can contact my office to receive a copy of the draft by-law, or to provide your comments. It is very important that the City received a variety of feedback on this matter from all parties impacted. As summer, or whatever you want to call the last couple of months, winds down, the Committee schedule for Council gets back into the full swing of things. The first week of every month is usually a busy one for me as I sit on Finance & Economic Development Committee, Transportation Committee and Agriculture & Rural Affairs Committee. Those three committees meet respectively on the first Tuesday, Wednesday and Thursday of the month. As a result, our next meeting of ARAC falls on Thursday, September 7th. At the time of print for this edition of the Messenger, I do not have the final agenda but it will likely be light. If you are interested in seeing the details of the upcoming ARAC meeting, please subscribe to our Rideau-Goulbourn e-Newsletter on our RideauGoulbourn.ca website or you can also find the agenda at Ottawa.ca as soon as it goes live. The Ottawa Carleton Plowmen’s Association (OCPA) Plowing Match is set for August 25th and 26th near Twin Elm, at the corner of Brophy Drive and Moodie Drive. On Friday, August 25th, there will be a brief opening ceremony at 11:00am followed by a VIP Plowing Competition and a light lunch and awards ceremony. From 1:00pm until 3:00pm, a “Plowing Workshop” will take place with coaches and equipment provided to encourage everyone, including the public, to learn more about the art of plowing. Rain or shine, the OCPA Plowing Match starts at 10:00am on Saturday, August 26th, with competitors from across the county vying for a spot to move on to the next level of plowing perfection using both modern and vintage tractors. The day will also showcase displays, vendors and farm equipment to examine and enjoy. All are welcome, and the $3 admission includes parking. Winners will be announced at a banquet that evening. All are welcome to it as well. Banquet tickets are $25 and should be purchased in advance by calling 613-913-0721. Plowers must plow at local matches to be eligible to plow at the International Plowing Match (IPM) and Rural Expo in Walton (Huron County), Ontario, September 19th to 23rd, which is celebrating the 100th anniversary of the IPM. In recent weeks and months, some of you may have noticed City crews out painting lines on our roads. Since the City’s line painting crews normally work at night, this might have been surprising to some and frustrating for others who were caught behind a crew while it was painting. They would normally work at night to avoid these types of traffic conflicts. Unfortunately, this summer hasn’t been like the ones before it. Due to the high incidence of rain during the months of May and June (the City’s weather forecaster reported that it rained 37 of 61 days during these two months), City staff lost 25 out of 70 pavement marking work shifts due to rain. Furthermore, this past winter was particularly harsh resulting in an unusually high amount of wear on the existing pavement markings and leaving many pavement markings more faded than usual. As a result, this significantly delayed their production schedule. To compensate, Staff are working additional shifts (as weather permits) to ensure that the completion of this program is done before the end of the season. As mentioned, this work would have ideally been done at night as it has been done in the past. As many of you know, each year Rural Ottawa South Support Services hosts its annual Walk of Care along the beautiful Doug Thompson Multi-Use Pathway. This year’s walk is scheduled for September 9th with the funds raised from the walk going to support ROSSS’ transportation and caregivers programs. Last year ROSSS provided over 15,000 drives to seniors and adults with disabilities and offered over 6,000 hours of respite for caregivers. Current data shows that 15.4% of Ottawa’s population are seniors. This number is expected to double by 2031 to 250,000 seniors. As a result of this services and programs like transportation and caregiver support are critical to helping seniors age in the communities they have called home for their whole lives. In Ontario, 65% of seniors over the age of 65 who receive care identify transportation as their number one need. 29% of Ontarians act as unpaid caregivers for family members, neighbours, or a friend. If you would like to help ROSSS continue to offer these needed programs in rural Ottawa, consider joining the Walk of Care. Registration and pledge forms are available online at www.walkofcare.ca. The Fall 2017 Newsletter and calendars of activities for September to December are now available at https://barrhavenseniors.com/. There are plenty of activities Monday to Friday, mornings and afternoons, and more new programs are being added throughout the year. If you have any questions, please contact Don at 613-440-3620. In this very column a couple of weeks ago, I mentioned that the City of Ottawa had received an Official Plan Amendment and a Zoning By-law Amendment to amend the Official Plan, Richmond Secondary Plan and Zoning By-law to allow 3 storey residential apartment buildings, 3 and 5 storey 124 unit retirement residence and 205 square metres of commercial uses all on a small private water works. The need for the amendments is due to the private water works, rather than the actual buildings. Over the last two weeks, I have been discussing this application with staff and the applicant and we have organized a public meeting on Tuesday, September 26th from 7:00pm until 9:00pm at the Richmond Agricultural Society’s Dining Hall. The City will be putting out a formal notice of this meeting in early September but I wanted to give a heads up well in advance. For more information on this application, please visit Ottawa.ca/devapps. Hydro Ottawa will be undertaking electrical system improvements in the coming months. The project involves replacing aging hydro poles on Flewellyn Road (between Munster Road and Conley Road). This work will improve the reliability of the electrical distribution system in the area. Work is scheduled to commence August 21, 2017, and continue until December 15, 2017. Residents will notice an increased construction presence throughout the duration of the project, including excavation activities. In order to minimize noise concerns, Hydro Ottawa will ensure that work is completed weekdays between 8:00am and 5:00pm. Traffic control will be implemented when required to ensure that roads and driveways remain accessible and safe to residents. Be assured that all residents and businesses in the affected area will receive advanced notice of the project and will be provided with a point of contact. Customers will also receive advance notification prior to any planned power interruptions affecting their premises. Hydro Ottawa is committed to delivering safe, reliable electricity service and keeping you informed of upgrades and emergency work taking pace in your community. If you have any questions, please do not hesitate to contact me. Please note that, due to the replacement of a culvert, Eagleson Road will be closed, between Barnsdale Road and Ottawa Street, from August 21st to August 30th. In April, residents of Manotick were invited to a workshop hosted by Minto to discuss their upcoming phases of their Mahogany development. On July 10th, they submitted the application for the next step in their project. The draft proposal for Phases 2, 3 and 4 is for a total of 926 residential units and will include open space, parks and a school. The unit count for these phases is consistent with the initial overall development unit count of 1400. In my estimation, the construction start for Phase 2 is still likely two years away. One substantial change over recent demonstrations of this development is that the school will move from Phase 3 into Phase 2. The school is proposed to be located on Bridgeport Avenue and adjacent to one of the new parks. This set of phasing will bring the development up to the forested area to the west. As a reminder, that forested area was recently acquired by the City of Ottawa and will be preserved as is. For more information on this application, please visit www.ottawa.ca/devapps. The Planning Rational and Draft Plan of Subdivision are available to view and will help answer any questions you may have. However, you are more than welcome to contact myself or Jeff Ostafichuk on this proposal as well. He can be reached at Jeffrey.Ostafichuk@ottawa.ca. In this column two weeks ago, I highlighted some upcoming budget changes with regard to infrastructure renewal. However, I also mentioned that, in the short term, the City was looking at doing what they could to address some current infrastructure needs in Richmond. In recent weeks, Council approved additional funding and some of that has been allocated to Strachan Street, from McBean to the dead end beyond Cockburn. This project is currently out to tender. My office receives many emails/calls about speeding in different communities. Although we are always happy to investigate traffic calming measures, the most effective action that residents can take is to report speeding to the Ottawa Police Service (OPS), which you can do online at OttawaPolice.ca. This is the only way the incident is formally reported and helps OPS plan accordingly. This small step could make a bigger difference in your neighbourhood. The North Gower and Richmond libraries have multiple events planned this summer. The North Gower branch is hosting a weekly “Summer Family Storytime” on Tuesdays from 10:30-11 am until August 15th. In Richmond, catch a “Family Reading Adventure” every Wednesday from 10:15-11 am until August 23rd. The Richmond branch is also hosting “Get Crafty” weekly on Fridays, 1:30-5 pm until August 25th. You can also visit the Manotick and Munster libraries to check out books for the whole family! Rideau-Goulbourn is home to two great Farmers’ Markets! The North Gower Farmers’ Market is open on Saturdays from 8:30 am to 1 pm and The Manotick Farmers’ Market is open on Saturdays from 9 am to 2 pm. Both run until October 7th. For more information, visit: www.ngfarmersmarket.com or www.ManotickFarmersMarket.com. Many in Richmond, and many others who have passed through over the years, have asked the obvious question about what will happen to the unfinished five storey building near Hyde Park and Richmond Lions Park. The original plan for the Immanuel House failed, unfortunately, and the initial developer went bankrupt. Since then, though, the property has transferred to a new owner, Silver Maple Developments. The City is now in receipt of an Official Plan Amendment and Zoning By-Law Amendment to allow multiple 3 storey residential apartment buildings, a 3 and 5 storey retirement residence and 205 square metres of commercial uses on a private water system. The site was previously approved as Hyde Park with Phase 1 completed as 92 residential townhouses on private roads off of Perth Street and with a private water system. Phase 2A construction is nearly completed and was approved as a three storey 35-unit retirement residence off of Talos Circle and Cedarstone Street. The proposal would see the use change to a 35-unit apartment building. Phase 2B is the partially built 5 storey building with the 3 storey wing. It is proposed to remain a retirement residence. Phase 2 would be serviced with an extension of the private well system and would be accessed off of Cedarstone Street and Talos Circle. Phase 3 would also be serviced with municipal sewer and the private water system and accessing of Talos Circle. It would consist of 8, 3-storey, 14-unit apartment buildings. The amendment to the Official Plan is required as small drinking water systems are only contemplated for institutional uses, such as schools and retirement homes not for residential uses. The amendment to the Richmond Secondary Plan would recognize a land use change from the institutional to residential to permit Phases 2A and 3 to proceed as residential apartments. It would also permit a 5 storey retirement residence and permit the commercial uses. The zoning by-law amendment would rezone Phases 2 and 3 from a Rural Institutional zone to a Village residential density 3 Subzone E exception to permit commercial and amend some of the zone provisions. Specifically, the front yard is proposed to be reduced from 9 to 3 metres, the rear yard from 11 to 10.6 metres, increase the height from 15 to 16 metres, reduce the drive aisles from 6.7 to 6 metres and consider Phases 2 and 3 one lot for zoning purposes. At this time, nothing is being imposed that would impact the existing 92 units in Hyde Park. I will be working with the applicant on hosting a public information session in the fall before this item comes to Agriculture & Rural Affairs Committee. If you would like to submit comments on this application, please contact Cheryl.McWilliams@ottawa.ca. One of the most significant issues that any Councillor deals with on a daily basis, and certainly every rural Councillor, is the state of our roads. Since 2012, Council has continuously worked to close the funding gap when it comes to infrastructure renewal. This would include buildings, parks, sidewalks, roads, etc. In 2012, Council approved a one-time funding program called Ottawa on the Move that saw $340M invested directly into renewal between then and 2014. Additionally, over the last six years, Council has set aside annual increases to our renewal budget to help close that gap in our annual budget. It has helped but it hasn’t been nearly enough. The commitment that has been made in recent years has seen vast improvements in our rural road network throughout Ottawa. Over 30% of all annual road renewal funding is spent in the rural area. This year, for instance, the City is resurfacing Shea Road, Bleeks Road and William McEwen Drive. In recent years, we’ve seen renewal of Moodie Drive, Century Road West, Donnelly Drive, Bridge Street, Church Street, Ottawa Street and so on. Every time the City resurfaces a road, though, there is really no time to rest on our laurels as we have an abundance of other roads that require attention. The last time that the City did a Long Range Financial Plan and updated its Asset Management Plan was in 2012 and the result was that increased commitment to renewal and the Ottawa on the Move program. In recent weeks, Council approved our next Long Range Financial Plan with a major focus on infrastructure renewal. Even though we had been adding more money in every budget, our annual funding gap toward renewal is $70M. We are spending $125M on infrastructure renewal when we should be spending $195M. That the contribution from taxation for the renewal of existing assets be increased by inflation (Construction Price Index) and an additional $10.5 million in the 2018 budget, as a priority within Council’s approved tax targets. That the annual contribution from taxation for the renewal of existing assets be increased annually by inflation and an additional $7.8 million per year starting in the 2019 budget for 9 years as outlined in this report. That staff continue to pursue permanent stable funding from the federal and provincial governments for the renewal of existing assets. This significant increase in funding will help advance more roads, parks and building renewal projects in the coming years. Further to that, we have also improved some additional funding for this year and I have been working with staff to try and secure some improvements in Richmond on Strachan, Martin and Colonel Murray. It likely won’t be full resurfacing but something better than the patch work that was done previously. There is an additional item on the agenda that is sensitive in nature and will be discussed In Camera. It involves a litigious matter dealing with a property in Osgoode Ward. Only two of the agenda items emanate from Rideau-Goulbourn and they are both zoning applications within the village of Manotick. 5514 Manotick Main Street is a new three storey office/commercial building at the corner of Bridge Street and Manotick Main Street. 1353 Scharfgate is a development application from Cavanagh and John Gerard Homes in the pre-existing development off of First Line Road. The address is misleading as the current property does not, and will not, have access onto Scharfgate Drive. The agenda and associated reports can be found online at Ottawa.ca. During the last five years, the Rideau Valley Conservation Authority (RVCA) has been conducting several hazard mapping studies on watercourses within the City of Ottawa and the RVCA area of jurisdiction. For some watercourses, old mapping will be updated; and for others, hazards maps will be created for the first time. Studies look at identifying two main types of hazards along the watercourses: flood risk and slope stability risk. These studies are being done through a collaboration involving the City of Ottawa and the Rideau Valley, Mississippi Valley and South Nation Conservation Authorities. The City recognized a need to update its zoning schedules based on up-to-date flood risk mapping, and has provided contributions enabling the Conservation Authorities to move ahead with these studies sooner than would otherwise be possible. Slope stability studies make use of new, highly detailed topographic data to identify toe and top of slope. This information is used to create an allowance area that serve as a flag of potentially unstable slope areas. Historical records, news clippings, photographs and local anecdotal stories and memories of past flood events can be useful in confirming the reasonableness of the calculations and resulting floodplain mapping. Local residents with this kind of information are encouraged to share their information and knowledge with RVCA’s Ferdous Ahmed (613-692-3571 ext. 1170 or ferdous.ahmed@rvca.ca). Those interested in learning more about the project or being included on our contact list are also encouraged to contact the RVCA. Once the technical work for individual study areas is complete and hazard mapping has been prepared, a public information session will be held to collect public feedback. Any new information or comments will be taken into consideration in further refinement of the mapped hazard limits. After amalgamation, streets names across the City were changed or altered to alleviate duplication. While the most obvious duplicates were changed initially, the process to correct every duplication was onerous each one took up a considerable amount of time. As a result, the process was changed in 2015 in order to get through the backlog of addressing anomalies. In Richmond, many residents will be receiving letters about new street names within the village. The issues being addressed at the moment involve streets that are cut off by the Jock River. As many residents know, most of the streets in Richmond straddle the Jock but don’t cross the Jock. Since this could cause challenges for wayfinding and emergency services, the City will be adding cardinal directions to the ends of each street with the fewest number of addresses. For instance, there are more homes on the north end of Lennox Street than on the south end so only the southern portion will have the cardinal direction added to it. The new streets names include King Street North, Burke Street East, Cockburn Street South, Lennox Street South, Colonel Murray Street South, Maitland Street South, Ottawa Street West, Royal York Street West, Queen Charlotte Street North, Fowler Street South and Cambrian Road West. Letters to affected homeowners will be sent by the City of Ottawa. In fact, you may have already received these letters. While these street names present minor conflicts and can be corrected by simply adding a cardinal direction, some other streets still require full changes. Currently, the City is looking at renaming one section of Links Drive in Country Club Village. Those residents have received notification. Further on, the City will be getting in touch with residents on Hamilton Street in Richmond as well due to the conflict with Hamilton Avenue. If you have any questions on any of these, feel free to contact my office. Many of you have likely noticed that construction is coming along nicely at Manotick’s newest park located in Dickinson Square. With the grand opening slated for July 2nd, the Remembrance Park is nearing completion having just had a split rail fence installed at the rear of the property. This work was completed by staff from the Rideau Valley Conservation Authority as well as community volunteers. The entire park has been a community effort and it is exciting to see it come this far. On another local construction project, the Manotick Arena expansion is well underway. Scheduled to continue through the fall, the City is working with the community and Arena user groups on finding ways to utilize the ice surface come October while the new space is still under construction. The new dressing rooms and community space on the second floor is scheduled to be available for use in January 2018. As for road construction, the spring weather hasn’t been incredibly friendly to our road crews and contractors. William McEwen Drive resurfacing is nearing completion with Shea Road just getting underway after several delays due to weather. Similarly, projects on Donnelly Drive, Harnett Road, Mackey Road and Gallagher Road are advancing and will be completed over the next two months. The Gallagher and Mackey projects are both different stages of a gravel road upgrade while Harnett and Donnelly will see microsurfacing. In 2016, 17,962 participants dropped off 646 tonnes of material at the City’s household hazardous waste depots. This represents an 8% increase in participation and a 16% increase in material collected over 2015 rates. This year, the Public Works and Environmental Services department (PWES) will continue to provide collection services for household hazardous waste such as corrosive, flammable or poisonous materials; by offering free one-day mobile depots from April 30, 2017 through to October 28, 2017. Our next depot will be held at the OC Transpo Park and Ride facility at 3355 Fallowfield Road on June 25th from 8:00am until 4:00pm. Electronic waste will also be accepted. Manotick Brass will be presenting “A Canadian Odyssey” to celebrate Canada 150 on June 24th at Knox Presbyterian Church in Manotick. This special program will feature all Canadian music including the world premiere performance of a new work titled “Aurora” by Saskatchewan composer Laura Pettigrew. The composition describes the Aurora Borealis which is so visible on the wide expanse of the Canadian prairies in northern Saskatchewan. “Aurora” was specially commissioned for this program by the Manotick Brass Ensemble and the composer will be attending the premiere performance in Manotick on June 24. “A Canadian Odyssey” is a musical journey which visits each province in the order they joined confederation. A short narrative introduces each province and sets the scene and a slide presentation created by Manotick resident Brian Cromie which will provide a visual enhancement of the music. The program features several new musical arrangements commissioned by Manotick Brass thanks to a generous grant from the Kiwanis Club of Manotick. These include two pieces by Vancouver composer Robert Buckley, “Cathedral Grove” which describes our heritage old growth forests on Vancouver Island and “Yukon Quest” which captures the excitement of a long-distance dog sled race. The program also features “Alberta Cowboy Songs” by Edmonton musician Trent Worthington and several arrangements by Ottawa musician E. F. Lloyd Hiscock. These include “La Metisse” attributed to Louis Riel and “Sunset on the St. Lawrence” attributed to Frederick Harris founder of the Frederick Harris Music Publishing Company. “A Canadian Odyssey” will be presented on Saturday, June 24th, 2017 commencing at 7:00pm at Knox Presbyterian Church in Dickinson Square. Tickets are $15 and are available at Knox Presbyterian Church, Manotick Office Pro or by calling 613-822-8749. With June comes Wild Parsnip. If you have been driving around rural Ottawa over the last week, you will have likely noticed small signs with red dots and green dots along roadsides. These signs are part of the City of Ottawa’s wild parsnip spraying program. Since 2015, we have taken a more aggressive approach with managing wild parsnip in the most affected areas. Through increased ditch cutting and spraying of a specific broad leaf herbicide, our efforts have proven effective. The red dot signs indicate to the contractor that a resident has opted out of the spraying program. The green dot tells the contractor when they can restart. However, property owners who have opted out of the spraying program should still consider their role in managing wild parsnip. As soon as the invasive weed goes to seed, it spreads. By keeping the ditches mowed in areas that aren’t being sprayed, it will prevent the plant from growing and spreading. Therefore, even if you’ve requested that there be no spraying in front of your property, I would strongly encourage you to help control the spread of wild parsnip by keeping those areas mowed. For more information on wild parsnip, please visit www.rideaugoulbourn.ca/wildparsnip. The City of Ottawa Farm Grant Program provides financial relief to working farmers. The grant program will assist eligible farm property owners by allowing the June final tax installment to be paid in December. Should you have any questions, please contact Revenue Branch from Monday to Friday, 8:00am to 4:00pm at 613-580-2444. TTY: 613-580-2401. The City of Ottawa offers two property tax deferral programs for low-income seniors and low-income people with disabilities. Eligible homeowners may apply for a full or partial deferral of annual property taxes. Application for tax deferral must be made annually to the City of Ottawa to establish eligibility or confirm continued eligibility. You may apply for one of the following programs: Full Property Tax Deferral Program or Partial Property Tax Deferral Program. For more information, visit ottawa.ca or call 613-580-2740. June is always a busy month in Rideau-Goubourn and across the City of Ottawa, with events such as Food Aid Day and the Mayor’s Rural Expo as well as Dickinson Days. Of course, there are Ottawa 2017 events and it all leads up to July 1st where Canada Day events will be taking place in North Gower and Munster. The report on coach houses in the rural area is the response to a direction that had been given by ARAC in the fall. Staff were asked to look at ways of reducing costs and process on building a coach house on private services in the rural area. The proposal before ARAC on June 1st does that. However, I feel more could be done and Committee will explore those options at the meeting. The report on the Mahogany Harbour Dock will provide an update on the status of this project and speak to the temporary Parks Canada facility being installed this season. It will also lay out the City’s role going forward from an ongoing maintenance perspective. The report on 1229 Dwyer Hill Road relates to the Dwyer Hill RV Park and the potential sale of the property. This report looks at waiving a portion of the Development Charges owed to the City of Ottawa by the current park owners. The waiver is only available to a potential purchaser and not the current owner. As usual, the monthly ARAC meeting is held at 10:00am at Ben Franklin Place in Centrepointe. On April 7th, 2017, amidst heavy rainfall and runoff occurring during the spring freshet, the City of Ottawa received eight calls from Munster residents who were experience sewage backups in their basement. Seven of these calls came from the southeast portion of Munster, on Middlewood Court and nearby Dogwood Drive homeowners. At that time, the pumping station became surcharged with stormwater and crews were quick to respond to alleviate the surcharge. Unfortunately, during this time, several homeowners closest to the pumping station saw backups. After some investigation, it was determined that the pumping station reached capacity due to the existence of sump pumps connected to the system. Since the backup occurred in early April, bypass pumping into the overflow lagoon at the Munster pumping station was activated earlier during rainy periods in early May to reduce the risk of basement flooding. The connection of sump pumps to sanitary sewers also caused capacity issues in Richmond during that same time in April. As a result, I will be working with City staff on developing a program that will seek to encourage the disconnection of sump pumps from the sanitary system. In the meantime, the City will continue to initiate the bypass measures earlier than done previously. As homeowners, there are options to protect your home against flooding as well. There is information on the City of Ottawa’s website regarding the Residential Protective Plumbing Program. If you did experience flooding as a result of the pumping station backup, you can also file a claim with the City of Ottawa. For more information on the protection program or on how to file a claim, please feel free to contact me at Scott.Moffatt@ottawa.ca. 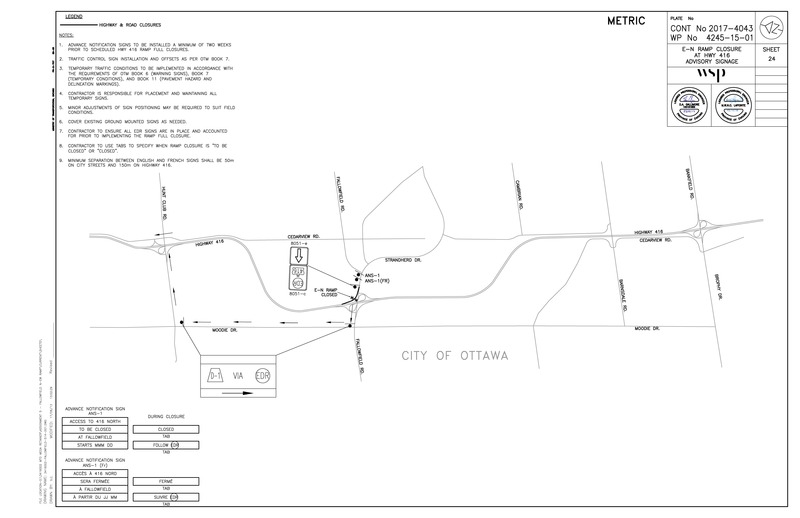 Beginning the week of the May 15, 2017th, the City of Ottawa commenced construction on the McLean Bridge Rehabilitation on Barnsdale Road. The City of Ottawa has retained the firm, RW Tomlinson Ltd., to complete the work. The McLean Bridge must undergo rehabilitation in order to extend its service life. Work will involve repairing the deck, widening the north sidewalk, removing and replacing the bridge railings, repairing the guard rails, concrete and steel repairs as well as some painting of steel members. The work is planned to begin in mid-May 2017 and continue until late October 2017. There will be an impact to traffic on the McLean Bridge. Traffic will be reduced to one lane for the duration of construction. With the assistance of portable temporary traffic signals, motorists will be able to safely pass over the bridge during construction. One direction of traffic will proceed at a time. OC Transpo will be impacted by the rehabilitation to the McLean Bridge and will experience a minor delay to the route. Pedestrians will have access to the McLean Bridge at all times. RW Tomlinson Ltd. will take every precaution to minimize interruptions to the normal life of your family, but as you can appreciate, there may be some inconvenience during the course of the operation of the work including noise and delays. We would like to thank you in advance for your patience and co-operation. 3-1-1. Should you have any inquiries, please do not hesitate to contact the Project Manager, Elizabeth Murphy at Elizabeth.Murphy@ottawa.ca or by phone at 613-580-2424 ext. 15397. Dickinson Days is happening in Manotick between Friday, June 2nd and Sunday, June 4th. The weekend events celebrate the birthday of Manotick's founder Moss Kent Dickinson with a parade, fireworks, street market, and so much more. You won’t want to miss the Gathering in the Square on Sunday, which be filled with live entertainment, horse drawn wagon rides, guided tours, a flour grinding demonstration, crafts for children, and lots of fun! The Dickinson House will also be open and will be doing a cake cutting and housewarming to celebrate the house being built 150 years ago. On Sunday the meal will be a ticketed mechoui barbeque with a choice of meat, salads, and fries. The cost of the meal is $12 for children 11 years old and under and $15 for adults aged 12 and over. We encourage people to reserve a table of 6 or 8. Tickets can be purchased by calling Watson's Mill at 613-692-6455. For a detailed schedule of events, visit watsonsmill.com. At the same time, you are welcome to visit the good folks at Dickinson House, as they too celebrate Moss Kent Dickinson. Not only are they honouring Dickinson and his achievements, but they are also part of Doors Open Ottawa. June 4th will be extra special, not just because of the aforementioned Gathering in the Square, but also the 150th anniversary of the construction of Dickinson House. To celebrate this milestone, special guests from the past will be in attendance. Please come and join them for a re-enactment of the Dickinson House housewarming for a piece of birthday cake at 1:30pm. If you have any other comments, questions or concerns, please feel free to email me on those as well or contact me by phone at 613-580-2491. For information on Rideau-Goulbourn issues, please visit RideauGoulbourn.ca. As many of you know, the City of Ottawa is celebrating Canada’s 150th in grand fashion. As part of these celebrations, we also have an Agri150 series where we showcase all the best rural Ottawa has to offer. It kicked off in February with the Fire & Ice event at Suntech Greenhouses and it will continue with nearly twenty additional events. One such event will take place on Sunday, June 25th in Rideau-Goulbourn. Our Secret Eats event invites guests to eat their way through the Rideau-Goulbourn Ward. As host of this event, I have the pleasure of guiding participants to four stops where they will eat, visit, and learn about the people and places that contributed to the history and character of Rideau-Goulbourn. Foodies will tour each destination on this Secret Eats adventure and sample some of the delectable local cuisine that awaits in rural Ottawa. The event runs from 11:30am until 5:30pm. Tour shuttles will depart from OC Transpo’s Greenboro Transitway Station, at the Park & Ride level. Tickets for Secret Eats are $45.20 + fees. A tour ticket enables free use of any OC Transpo bus route and the O-Train Trillium Line, to and from Greenboro Station. Tickets are to be shown to the bus operator when boarding. Free service is available from three hours before the tour until three hours after the tour. For more information on Ottawa 2017 and Agri150, please visit Ottawa2017.ca. The Ottawa Rural Clean Water Program (ORCWP) provides funding for projects that protect surface water and groundwater quality. Landowners completing projects in 2017 may be eligible for grants of up to $15,000 depending on the project they are undertaking. The next application deadline is May 1, 2017. Grants are available for 18 kinds of projects related to nutrient management, soil protection, water management, land stewardship, and education and innovation. Applications will be accepted through the LandOwner Resource Centre, which works in partnership with the Mississippi Valley, Rideau Valley, and South Nation Conservation Authorities and the City of Ottawa. Contact the LandOwner Resource Centre at 613-692-3571 or toll free at 1-800-267-3504 ext. 1136. Visit www.ottawa.ca/cleanwater to see a full list of eligible projects and to download an application form. On Friday, April 28th, Ottawa City Hall hosted a ceremony with the Governor General’s office to honour the dedication of many of Ottawa’s finest volunteers. The Sovereign's Medal for Volunteers recognizes the exceptional volunteer achievements of Canadians from across the country in a wide range of fields. As an official Canadian honour, the Medal for Volunteers incorporates and replaces the Governor General’s Caring Canadian Award. The Medal builds on the legacy and spirit of the Caring Canadian Award by honouring the dedication and commitment of volunteers. It is the highest honour bestowed upon volunteers in Canada. It was an honour to be present at this ceremony alongside Mayor Jim Watson and Her Excellency Sharon Johnston. Recognized from Rideau-Goulbourn were Munster’s Bob Easy, Manotick’s Noel Norenius, Richmond’s Judy Wagdin, Cyril Leeder and John Curry of Stittsville as well as Shaun Tolson and Georgina Tupper of Kars. The ward was well represented and these individuals were rightly honoured for their volunteer efforts across our communities and throughout the City. As mentioned in previous weeks, there will be a number of construction projects throughout the summer across the ward. Two weeks ago, the Commence Work Order was issued for the expansion project of the Manotick Arena. This project will include a doubling in size of the change rooms, new community space on the second floor as well as connection to municipal services and a number of lifecycle projects. The general contractor is Gaulec Construction out of Orleans and the project is expected to carry on through the fall. The City will be working with the various user groups in the coming weeks and months on plans to address the space restrictions in the fall. Construction also continues on the Remembrance Park next to the Cenotaph in Dickinson Square. That project is scheduled to wrap up next month with the official opening being held on July 2nd. Cavanagh Construction has begun mobilizing on Shea Road. Shea will be resurfaced from Fernbank Road to Hemphill Street in the village of Richmond. In just over a year from now, the big celebration weekend for Richmond’s bicentennial will be upon us. Between now and then, though, the community is focused on raising money to help with the celebration and party while they’re at it. This summer, you can join in on the fun at two major events. On Thursday, May 25th, come out to Jabulani Vineyard & Winery for “A Taste of Richmond”. Sip and sample great wines, craft beers and the Richmond culinary community’s food in the beautiful setting at Jabulani. Tickets are $75 and can be purchased at 3441 McBean Street. On Saturday, June 24th, it’s “The Best Damn Barn Dance in 199 Years!” at the Richmond Fairgrounds. The event runs from 8:00pm until 1:00am and features local legends the Doug & Pam Champagne Band. Tickets are $15 in advance and $20 at the door. They can also be purchased at 3441 McBean Street. For more information on how the community is celebrating 2018, visit Richmond200.ca. 2017 is not only Canada’s sesquicentennial, but also the 150th birthday of Dickinson House. Moss Kent Dickinson built the house in the Square in 1867 and, to celebrate, there is a special exhibit; “A Walk Through the Decades”. Young and old are cordially invited to come and gain insight into life in Manotick and Canada over the past century and a half. The House will open for the season daily for 10:00am to 5:00pm beginning on May 20th. Admission is free, and donations are welcome. This year, the Mayor’s Annual Rural Expo and Food Aid Day is taking place at City Hall on Friday, June 2nd. This event raises funds in support of the Ottawa Food Bank while providing a forum to showcase all of the unique features of rural Ottawa within the downtown core. Come check out rural vendors and displays, and stay for a BBQ lunch with burgers cooked by the Works restaurant. There will be live entertainment, a celebrity milking contest and petting zoo on site. We hope that you can join us for a fun filled afternoon. The Food Aid BBQ helps the Ottawa Food Bank raise funds to sustain its food programs and support local farmers. All proceeds from the BBQ are donated to the Ottawa Food Bank. If you are a rural artesian or farmer or represent a unique rural destination are interested in setting up a free vendor booth to sell or promote your services at the Rural Expo please contact the Rural Affairs Office or telephone Geraldine Wildman, 613-580-2424 ext. 27815. Effective April 26, 2017, the Ottawa Police Service will be introducing a single telephone number in which to contact us for all non-emergency enquiries. If you need to reach police by telephone for a non-emergency, you can call (613) 236-1222 to report any type of report from vehicle theft to harassment complaints. Also, instead of having to find the proper extension to reach a desired party, our new automated Integrated Voice Response (IVR) system will connect you to the right section or person. All emergency or life-threatening calls will continue to be made utilizing 9-1-1. In response to evolving technology, residents may instead choose to file a complaint online. Some of the reports you are now easily able to file online include: Thefts, Damage to Property, Traffic Complaints, Drug Complaints, Fraud Complaints, and Hate Crimes. Residents can also utilize our on-line service if they wish to add supplemental information to an existing report. As a valued partner, we felt it was important to let you know about these changes so that you can communicate with your constituents as early as possible. These improvements have been implemented to allow the OPS to better serve the residents of Ottawa. The item on Coach Houses is just some minor changes to the policy. I continue to work with staff on addressing the main issues relating to the requirements for a hydrogeological study and Site Plan Control. Similarly, the Omnibus report includes minor changes to certain properties and by-laws, including a property in Richmond that was incorrectly rezoned during the 2010 Richmond Community Design Plan process. The Official Plan Amendment for Tenth Line Road, Wall Road and Trim Road is an application to re-designate agricultural lands to general rural. The recommendation is to refuse the application. The Zoning By-Law Amendments on Larry Robinson Road and Rideau Valley Drive South are to prohibit residential uses following approval of surplus farm severances. The Zoning By-Law Amendment for 557 & 577 Jinkinson Road is to permit Rural General Industrial uses on portions of the properties that are setback from the natural heritage features on the properties. A large portion of this property is already zoned Rural General Industrial. The abandonment of a portion of the Staidler Municipal Drain includes a section north of Mackey Road and includes the Brooks Branch. A request for abandonment must be made by owners representing no less than 75% of the area assessed for benefit under the by-law for the drain. That has been met in this request. This item was originally on the March agenda but was deferred. The full agenda with reports is available at Ottawa.ca. Every month, our office also sends out an e-Newsletter with the agenda and link to the reports, among other information. You can sign up for these at rideaugoulbourn.ca. Our next one will be sent out this Friday, April 28th. Two weeks ago, I provided an update on the property that used to be home to the Falls House. As many have likely seen, there is a new retail/office building proposed for the site. Since last year, a group of community leaders has been assisting me in working with the owner of the property. Just last week, this same group had the opportunity to sit down and discuss the proposed design with the owner and the architect. At the meeting, the architect presented some revisions to the design which responded to some of the comments we have been hearing from the community. Those present felt more improvements could be made to help soften the look of the building and make it more of a feature in the village, knowing the importance of this site. As a result, the owner and architect have agreed to look at further revisions. This work has already commenced and we will be updated as soon as possible. Please stay tuned to this column for further updates. More information on the background and current application for 5514 Manotick Main Street are available at rideaugoulbourn.ca/fallshouse. On Friday, April 28th, from 7:00pm to 9:30pm, come on out to the Manotick United Church and enjoy a fun, interactive session of dance, laughter & music. Join the Ever Hopeful Stringband and caller Pippa Hall for a family-friendly, alcohol-free evening of community dancing, including circles, squares and contras. Each dance is taught and the whole family is invited. The evening begins with simple dances, followed by dances that build on skills as the evening progresses. Admission is $10; $5 for those aged 12-18; participants under 12 are free. There is also a family maximum admission of $20. For information, please call 613-692-4576 or visit http://dance.manotick.net. For more details or to register, visit www.golf4youth.ca. Hopefully we can make this a successful event that will benefit our youth and families all across Rideau-Goulbourn. TransCanada is proposing to replace the existing Richmond Sales Meter Station, with a new sales meter station called Richmond North Sales Meter Station. The proposed Project will provide TransCanada with the capability to accommodate a customer’s request for additional natural gas capacity. The Project is co-located at two adjacent TransCanada sites – the Richmond Sales Meter Station and the Stittsville Compressor Station, both located at 6783 Fallowfield Road, between Conley Road and Huntley Road, in Stittsville. Meter stations are an important piece of infrastructure for a natural gas pipeline system. They are used to measure the volume and composition of natural gas transported through a pipeline. Construction of this Project involves the building of a new sales meter station and the installation of piping adjacent to the existing Stittsville Compressor Station site. A new pipeline connection will be built from the new meter station to the existing customer connection in the southeast end of the meter station property. The Project will also include the removal of the existing meter station and connection piping, currently located at the southern end of the property. All work will take place within TransCanada’s existing station properties. Subject to National Energy Board approval, construction is anticipated to begin in summer 2017 and last approximately three months. The facility is anticipated to be in-service in November 2017. More information is available on TransCanada’s NEB application here: http://tinyurl.com/k73ho35. Everyone is vulnerable to fraud, including you. Sadly, the Internet has made it much easier for criminals to take advantage of people, and much more difficult for investigators to track. This tax season, protect yourself against online scams. The Canada Revenue Agency (CRA) does not send emails or texts with links requesting your financial or other personal information. Don’t give your personal information over the phone until you have checked the status of your CRA account. Be suspicious of emails that ask you for confidential information. If it sounds too good to be true, it probably is. Be wary of contests asking you to pay money to collect your prize, or winnings for contests you did not enter. Take your time to think and ask questions. Contact someone you trust for a second opinion. In last week’s column, I joked about the end of winter but I didn’t anticipate all of spring occurring over a matter of two days. I hope everyone has had a chance to dry out. When we get these extreme weather events, there can tend to be adverse effects on certain operations. Last week’s rain was no exception as the Richmond Pumping Station was impacted. This past Friday afternoon, the Pumping Station was nearing capacity and a by-pass was put in place to prevent a potential failure of the system. The by-pass diverted overflows directly into the Jock River. By-pass pumping from the Royal York Street Pumping Station ceased at 9:00pm that same evening. City Staff recorded that 4,300 cubic meters of wastewater was pumped into the Jock River. Unfortunately, due to severe flooding, the Richmond Lagoons by-pass valve, which would normally redirect any overflow from the wastewater system to the lagoons, was in-accessible, leading to the by-pass operation that ultimately took place. Due to the high water level of the Jock River, the by-pass overflow line leading from the pumping station to the Jock River was lower in elevation than the Jock River Water levels. The decision was made by staff to actively pump wastewater from the station so water in the river would not backfill into the pipe which would have caused the pumping station to flood. This would have resulted in the City losing operational control of the pumping station and the integrity of the system as a whole. Staff remained onsite throughout the weekend to monitor the wastewater system. The Ministry of the Environment was notified at the beginning of the by-pass operation. Regular operations of the wastewater system have resumed. This event was caused by the heavy rains coupled with the spring freshet. There are plans to upgrade the Pumping Station and forcemain to accommodate future growth and the increased capacity in the coming years. Part of that upgrade is taking place currently between the pumping station and Eagleson Road. The entire project, funded by growth, will see the station upgraded and a twinning of the forcemain from Richmond into Kanata. As residents in Richmond may have noticed, the City has closed access to the west sidewalk on the McBean Street Bridge because of concrete deterioration. As you may recall, the City undertook some improvements to the east sidewalk a few years ago and, at that time, there was no funding available to address the deterioration on the west side. Since the east side is used more frequently, it was repaired and widened. Recently, the City received a service request for the west sidewalk due to continued concrete deterioration propagating to the edge of the narrow sidewalk on the west side of the structure. Staff have inspected the bridge and the railing and posts appear to be sturdy. Therefore, there are no concerns structurally but the concrete deterioration led to the closure. Staff considered temporary repairs pending the planned replacement of the bridge in 2018. To do that, the west sidewalk would still need to be closed for repairs and then the entire works would be replaced in 2018. Staff felt that closing the narrow west sidewalk would not severely impact the level of service and prevent wasting money with the full repair slated for 2018.